Bought this recently, rarely modelled, i couldn`t resist it. Came with a MERCO .35 2 stroke on a 11x7 3/4" prop. 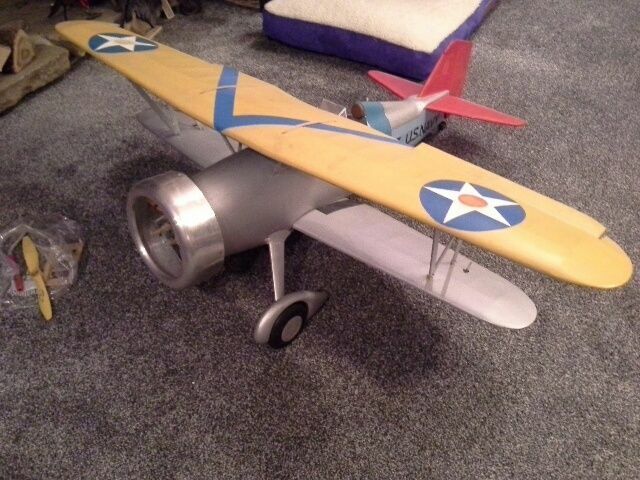 49" span, 3.9Lbs airframe only, no servos etc. I remember back in the 60's a guy in ODMAC had a similar one of these, I think it was a Marataka or Royal kit, around the same size, called a Curtis Hawk P6 I think. He never manager to get it to take off from the ground as it was so unstable & ground loopy. So he had to hand launch it. I can see him now running down the field, transmitter in one hand & the model in the other & hurling it skywards. I won't embarrass him by naming him & he was a good deal older than me & could have passed away. He had a Merco 61 in it I think. Good luck trying to electrify it. I'm guessing that, kitted out, the model will weigh around 5lb with battery. With those tapered wings the wing area is not going to be huge, so I would err on the side of more power than you may normally need for a biplane of that span and weight - around 500W. 4s would be best for that, and your 750kV motor should be ok to swing a large enough prop to clear that big cowl. 3000mAh should give reasonable duration. Making battery access could be interesting! Ok, cracking on with this, spot on Trevor, weight is a smidge over 5lb, gone 5s a123 cells, they fit in perfectly under the u/c hatch which holds the u/c on with two bolts, motor is a Propdrive 38-42 1000kv on a 12x6 prop giving around 600W. Big question is where is the Cof G? I don`t know what plan this was built from, i have looked at several Curtiss P6 Hawk plans online and they all have different CofG positions! Obviously i cannot afford to get this too far rearward, i would rather err on the safe side. Your thoughts would be most welcome! This is the plan for the Royal P-6E, which is basically the same aircraft with an inline instead of a radial, Cof G looks to be slightly forward of the top wing centre line, based on that my model would balance perfectly. Ok, cracking on with this, spot on Trevor, weight is a smidge over 5lb, gone 5s a123 cells, they fit in perfectly under the u/c hatch which holds the u/c on with two bolts, motor is a Propdrive 38-42 on a 12x6 prop giving around 600W. Not potty at all, the Royal plan shown in the link above shows it under the model, if you transpose that to the top wing it is just under 1/2 of the top wing cord at the widest point. 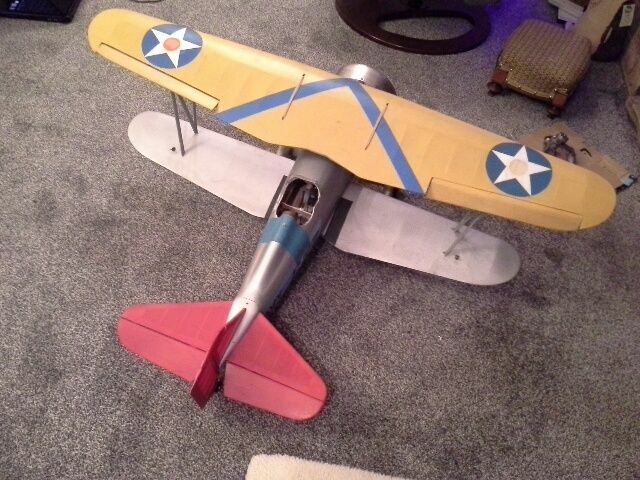 This is getting close to a maiden flight now, it has working flying wires to hold the interplane struts in place, what are peoples opinion on the top wing bands, should they be crossed? I've never had any problem with the bands fore and aft on my 1 1/2 Strutter. Ok, there will be a delay before i get this airborne, one of the last jobs was connecting the aileron rods up from the bottom wing which contains the servo and bellcranks to the top wing which has the ailerons. you can probably guess that there is plenty of play in the bellcranks, aileron free movement is 1/4" only option i can see is to strip the underside covering from the top wing and put mini servos in.